Subscribe to TGIM, a weekly newsletter packed with internet marketing gems! Hi there! Thanks for your interest in my Award Winning newsletter. Every Monday, I give praise to our Lord by sending out an email rich in information, trend research, case study data and, in some cases, personal updates to keep you entertained. Also, each week, I include a BONUS private label digital product for you to capitalize on in your internet marketing endeavors. Because I value new relationships, I’m now including a FREE BONUS INSTANT DOWNLOAD for you to capitalize on immediately after subscribing to TGIM. My newsletter is not only a great way to start the work week, it comes with a Free Bonus! 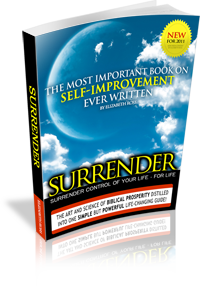 Your bonus today is a Free PLR eBook titles “Surrender,” a self-empowerment ebook written by Elizabeth Ross. This eBook is Yours to Claim as Your Own! Republish and Sell for Profits – This is NOT an Affiliate Program! It’s Your Ebook! This ebook was written to help you reach or surpass your goals as a servant of Jesus Christ, the Lord and Savior. Legally & Ethically CLAIM the work as YOUR OWN! RESELL this eBook for instant $$$ PROFIT $$$ and KEEP 100% of the money you Make with the eBook! GIVE AWAY the eBook as Value Added or as a Free Bonus! If you are not familiar with Private Label Rights, you must read up on this revolutionary trend that’s taking over the world, allowing people like you to be a successful, published author even if you’ve never written anything in your life. Private Labeling, a byproduct of ghostwriting allows anyone to claim themselves as author of books or ebooks purchased & sold with private label rights. We’re not talking award winners here, but solid foundations never the less. To Subscribe to TGIM and Receive your Free Bonus Download, simply fill out the short form below. Your subscription will begin the following Monday. Your Download details will be emailed to you automatically. In the event you do not receive your Free Bonus Private Label download in a timely fashion, please contact customer support.